NCR SelfServ 84 Drive-Up - Technology Unlimited, Inc.Technology Unlimited, Inc.
Transform: NCR Interactive Assisted Teller enabled. Connect consumers to the efficient delivery of convenient live teller services from the ATM across extended hours and locations. Engage: Supports the NCR software platform including personalization and targeted marketing opportunities. 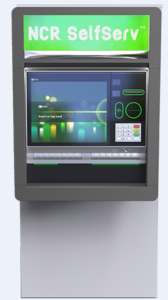 Available: Enhanced ATM module reliability via Media Handling 2.0. Flexible, future-proofed dispense, deposit and recycling options. Secure: Security designed in for more effective risk management and fraud prevention. Includes: strengthened shutter, cash/consumer camera and new flush SPS card reader.